Top Chef's ninth season finale took several solid steps toward redeeming a rocky season that's been more memorable in its bad moments than in its good. The opening montage set up an accurate portrayal of how I imagine most people would sum up our two contenders: We see clips of Sarah clashing with various Top Chef contestants before being wheeled off on a gurney following a near heatstroke, coupled with courteous Paul nailing challenge after challenge. In some ways this isn't fair—Sarah's an excellent chef, and as we're reminded by her team later, runs an outstanding restaurant here in Chicago. Her behavior, though, has often been so much louder than her cooking, and I found her so abrasive that I could hardly focus on the latter. So while I'm sure she garnered her fair share of praise throughout the season, it's far less memorable than her red-faced meanness. I didn't go out of my way to vilify Sarah, though. I've been conditioned to think this way throughout a season that has focused more on creating melodramatic moments and slapstick shenanigans than it has on creating provocative culinary challenges for its chefs. The ridiculous constraints placed on the chefs this season, which culminated two episodes ago in making the chefs ski around for awhile for no reason, made cooking—the whole point of the show—an afterthought. It's hilarious to me that the judges agree that these two chefs "peaked at the right time." This season didn't allow for them to peak at any other time. Give the chefs a little inspiration and freedom, and they'll cook. The elimination challenge tonight is no real surprise: The chefs must deliver a four-course dinner that represents the restaurant of their dreams. As far as inspiration goes, that's a huge, meaningful carrot. It's likely a menu they've been thinking about well before their Top Chef debut. But rarely does the finale come without a few wild cards. First, there are the sous-chefs. 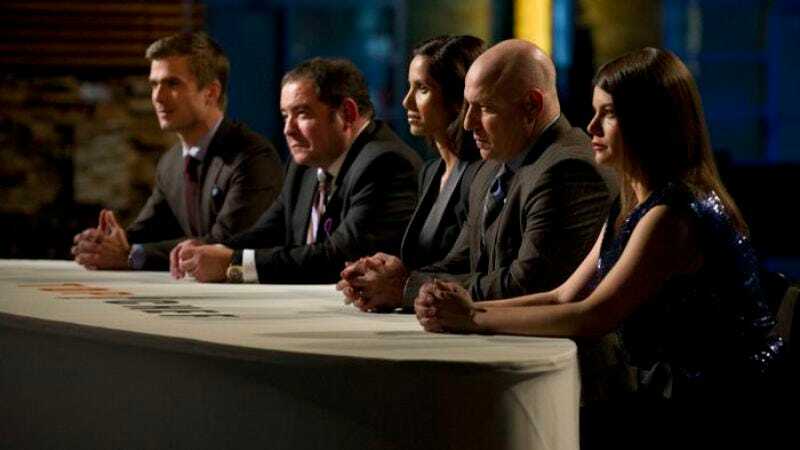 Top Chef in seasons past has trotted out former contestants of varying caliber. Drawing loser chefs who've performed poorly can prove a handicap, and drawing a super-recently eliminated chef means he arrives with a fair amount of psychological baggage. Tonight's episode brought back a completely mixed bag of chefs: two professional chefs, a sea of previous contestants, and then a few whose faces look vaguely familiar from the first two episodes of the season, which were really just casting specials in disguise. How those chefs are divvied up is brilliant, though: instead of taking turns choosing, or drawing knives, Sarah and Paul must select chefs based on their quickfire dish. Sarah and Paul then have no one to blame but themselves for the sous-chefs they end up with, and it's exciting to see the eliminated chefs mess with any expectations we might have of them. Enter hacky-cocky butcher boy, whose name isn't really worth looking up. (Okay, it's Tyler Stone, but even Bravo has deleted the bios of these guys from its Top Chef page.) He's the extreme example of the chef-you-don't-want-on-your-team; Tyler never even made it to judge's table. He was eliminated by Tom halfway through the challenge for his inability to cut a piece of meat properly, and it was such a soul-crushing moment for the smug young lad that it's probably among my highlights for the season. But the beauty of this challenge is that, hey, he could freakishly throw together a dish that could land him with Sarah or Paul. And he does! Almost. Sarah thinks she remembers his dish from Heather's restaurant menu and that Heather could be sending her a secret Chicago mean-girls sign by making it. Unfortunately for Sarah, she's dead wrong about this. Tyler Stone is behind door number three and risks wrecking her for the finale. Paul nails his choice out of the gate, selecting one of the master chefs. The rest of the chosen chefs are regulars from the season. Next wild card: family. It takes the chefs out of "this world," as Sarah says tonight, and can throw the chefs emotionally. Take Kevin Gillespie's performance during the finale in 2009. He choked at the end, in part because he was going through a divorce with his wife and bringing his mother on during that time was distracting. Here, again, the producers couldn't have played it better. (How are these the same people that gave us the chef winter Olympics?) The family still makes the show. We get the same warm, fuzzy shots of them reuniting and the emotion this stirs in the chefs, but the chefs don't realize their family is there until they're well into service. It's not a distraction, it's just a nice surprise. Final wild card: managing a staff, saying no to everyone. Some finales have been smaller in scale, but this one really does approach Restaurant Wars level. The chefs are cooking with a staff of four, serving 100 guests and judges. Having seen Sarah and Paul's performances during RW, during which they both behaved poorly from a management perspective, this could have been a difficult challenge for them. With Restaurant Wars, though, even though it's a team challenge, people are still primarily looking out for themselves. Here, neither Paul nor Sarah have any trouble stepping up and commanding when they know that's their role. And having learned from previous seasons of Top Chef, they know not to take too many suggestions from their sous-chefs on cooking techniques or style. Who knows, maybe Carla would have taken the win from Hosea in Season 5 if she hadn't listened to Casey and tried sous-vide for the first time. In any case, Paul and Sarah consistently listen to and then reject suggestions from their sous chefs. Smart. Structurally, this finale had another thing going for it. Splitting the restaurants into two locations and two different seatings had a few nice effects. The chefs have no room to psych each other out, and more important, we get to see how consistently they're able to deliver their courses. When things go awry, as did Sarah's funkily textured polenta, she has time to correct it. This worked the other way around, too, with Paul over-firing his chawanmushi during the second round with no viable plan B. For menus, Sarah looks to combine her German roots with Italian for the night, and Paul served Asian-inspired plates. Both chefs performed almost flawlessly, with the judges really nitpicking during the final rounds. Sarah's pickled beets weren't quite pickled enough; both had a slight hiccup of inconsistency between the two seatings. I'd have loved a little more footage from the judge's table—how, for example, do you judge food that's so incredibly different? They went course by course for awhile, but this certainly didn't come down to a scorecard. Sarah might have taken more risks during this final round, but Paul has consistently delivered excellent, carefully balanced food throughout the season. In the end we're not sure exactly why or how he edged out Sarah for the win. His dishes tonight might have not veered far from his own comfort zone, but he certainly pushed the chefs out of theirs, and he did surprise them. Consider the comment when they first sat down at the table—no meat on the menu! Winning these judges over with fish and eggs is a feat. Going into the final moments of the show, I honestly thought it would be Sarah. The praise for her dishes seemed more gushing, especially for her pasta and dessert. The praise for Paul was a little more cautious, aside from Emeril's obsession with his broth or Hugh's love of his congee. Sarah might have been the safer choice, but Paul's certainly the better one. I'll start planning my trip to Austin now. — I regret that I'd never heard "jam out with our clams out" before tonight. Thank you, Grayson. Thank you. — Tyler certainly lived up to his villainy. So glad he didn't make the original cut. — Best food ever during a Top Chef finale, says Tom, as he often says. Funny how the food seems to get better but the show's getting worse.